= Obovaria subrotunda (Rafinesque, 1820). — Watters (2018). = Obovaria subrotunda (Rafinesque, 1820). — Williams et al. (2017). = Obovaria subrotunda (Rafinesque, 1820). — IUCN (2017). = Obovaria subrotunda. — Inoue et al. (2013).
? Lampsilis orbiculata Hildreth. — ITIS (2012). = Obovaria subrotunda. — Haag (2012). = Obovaria subrotunda (Rafinesque, 1820). — ITIS (2012). = Obovaria subrotunda Rafinesque, 1820. — Bogan (2010). = Obovaria subrotunda (Rafinesque, 1820). — Watters et al. (2009).
? Lampsilis abruptus (Say, 1831). — Watters et al. (2009). Obliquaria (Rotundaria) subrotunda Rafinesque, 1820. Rafinesque, 1818, Amer. Mon. Mag. : 355 [as ‘Potamilus subrotundus’] [nomen nudum]. Rafinesque, 1819, Jour. Phys. Chim. Hist. Nat. : 426 [as ‘U. (Obovaria) subrotunda’] [nomen nudum]. Rafinesque, 1820, Ann. Gén. Sci. Phys. : 308, pl. 81, figs. 21-23. Rafinesque, 1864, [in] Binney & Tryon, reprint: 23, 29, 52. Type(s): NEOTYPE ANSP_20254, Kentucky River. Rafinesque, 1864, [in] Binney & Tryon, reprint: 54. Obovaria striata var. rosea Rafinesque, 1820. Rafinesque, 1864, [in] Binney & Tryon, reprint: 55. Obovaria striata var. 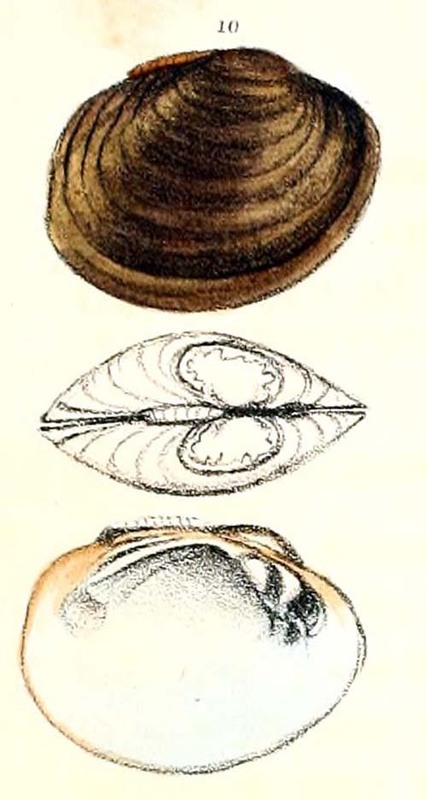 tuberculata Rafinesque, 1820. Unio (Aximedia) levigata Rafinesque, 1820. Rafinesque, 1820, Ann. Gén. Sci. Phys. : 296, pl. 80, fig. 11-13. Rafinesque, 1864, [in] Binney & Tryon, reprint: 42. 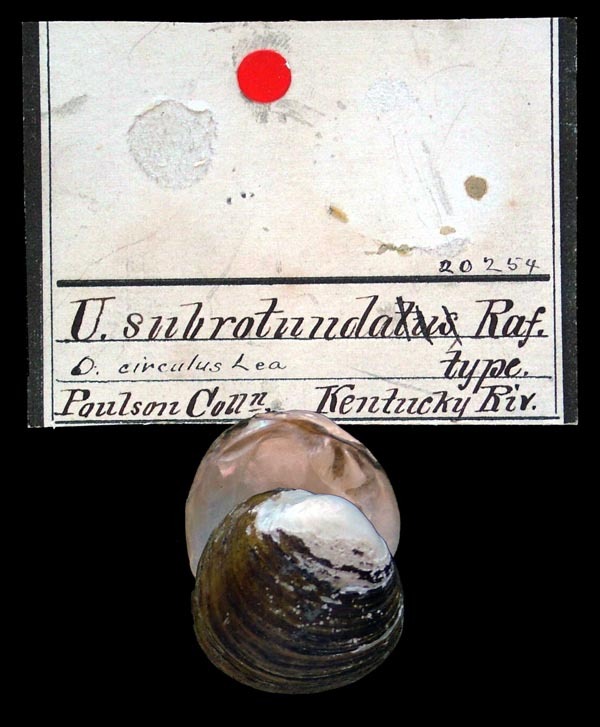 Type(s): LECTOTYPE ANSP_20255, Kentucky River. Unio (Aximedia) zonalis Rafinesque, 1820. Rafinesque, 1818, Amer. Mon. Mag. : 355 [as ‘Potamilus zonalis’] [nomen nudum]. Rafinesque, 1820, Ann. Gén. Sci. Phys. : 297. Rafinesque, 1864, [in] Binney & Tryon, reprint: 22, 42. Hildreth, 1828, Amer. J. Sci. : 284, fig. 15. Wood, 1828, Suppl. Index Testac. : 57. Wood, 1828, Suppl. Index Testac. : 2 [as ‘Mya rotunda’]. Wood, 1828, Suppl. Index Testac. : 57, pl. 1, sp. 1 [as ‘Unio rotundatus’]. Wood in Hanley, 1856, Index Testac., Suppl. : 199, pl. 1, fig. 1. Lea, 1829, Trans. Amer. Phil. Soc. : 433 , pl. 9, fig. 14. 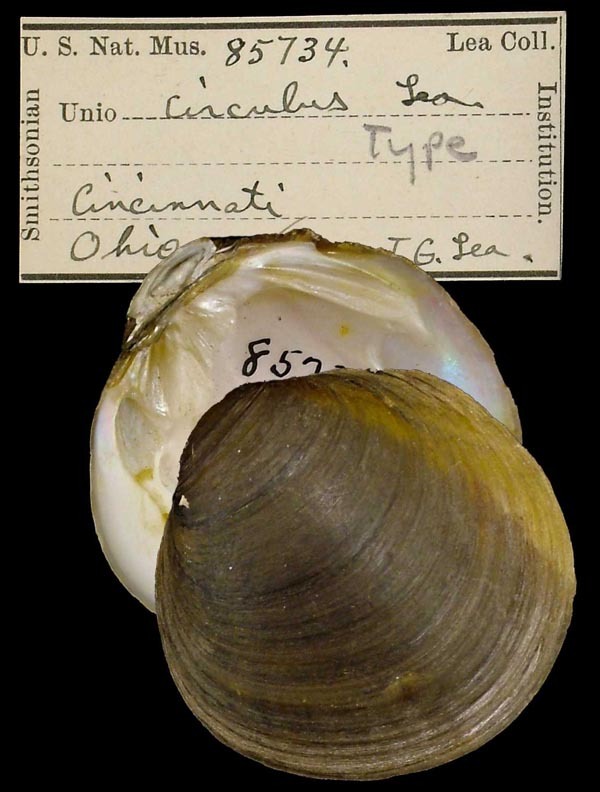 Type(s): UNKNOWN USNM_85734, Cincinatti, Ohio. Lea, 1831, Trans. Amer. Phil. Soc. : 80, pl. 8, fig. 10. Say, 1834, Amer. Conch. : [no pagination]. Ferussac, 1835, Mag. Zool. : 28. Lea, 1836, Synopsis Fam. Naiades: 59. Lea, 1852, Synopsis Fam. Naiades: 57. Conrad, 1853, Proc. Acad. Nat. Sci. : 251. Ortmann, 1921, Mem. Carnegie Mus. : 92. ‘selon Say’ Ferussac, 1835, Mag. Zool. : 26. 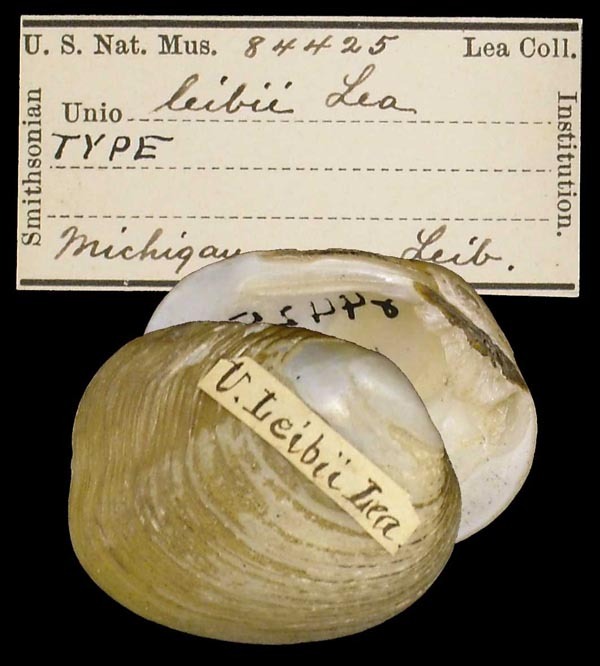 Margarita (Unio) orbiculatus Lea, 1836. ‘Hild.’ Lea, 1836, Synopsis Fam. Naiades: 25. Conrad, 1836, Monogr. Fam. Unionidae: 35. Mörch, 1853, Cat. Conch. Yoldi: 46. Lea, 1866, Jour. Acad. Nat. Sci. : 44 , pl. 15, fig. 42. Conrad, 1866, Amer. J. Conch. : 107, pl. 10, fig. 1. Simpson, 1900, Proc. U.S. Nat. Mus. : 744. Simpson, 1914, Descr. Cat. Naiades: 731. Frierson, 1927, Check List N. Amer. Naiades: 90. Obovaria lens var. 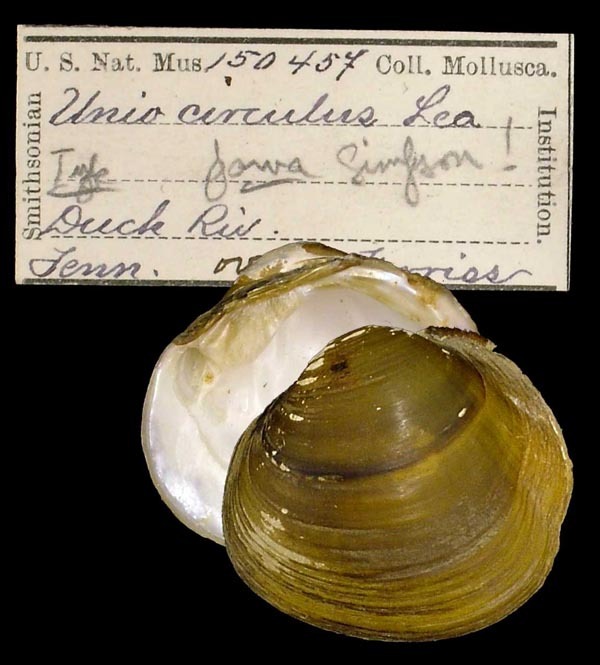 elongata Simpson, 1914. Simpson, 1914, Descr. Cat. Naiades: 294. Obovaria lens var. parva Simpson, 1914. 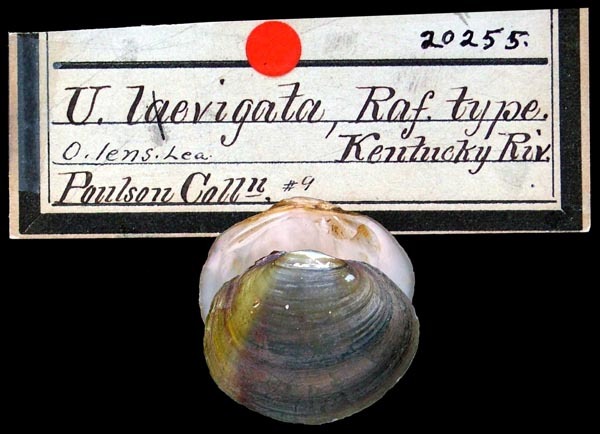 Type(s): LECTOTYPE USNM_150457, Duck Riv., Tenn.
Obovaria subrotunda globula Morrison, 1942. Morrison, 1942, Bulletin Bur. Amer. Ethnol. : 360. 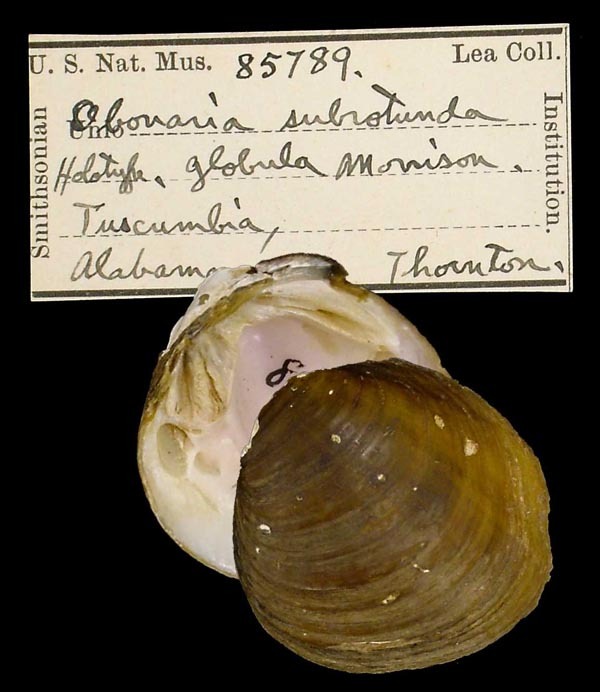 Type(s): HOLOTYPE USNM_85769, Tuscumbia, Alabama. Unio suborbiculatus Kuster, 1857 .